FORT LAUDERDALE, Florida- Ambassador Albert R. Ramdin, a Surinamese diplomat, was elected Tuesday evening to be the next Assistant Secretary General of the Organization of American States. Ramdin emerged victorious on a vote of 19 to 14, with one abstention, among the 34 member states, as the hemisphere’s foreign ministers gathered at the OAS General Assembly session in Fort Lauderdale. 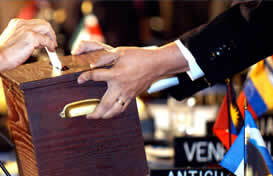 The other candidate was the former Nicaraguan foreign minister Ernesto Leal. Signaling top priorities he intends to help the new Secretary General, José Miguel Insulza, advance, Ambassador Ramdin said the OAS needs to assert its relevance by developing a forward-looking agenda that responds to changing political, social, economic and security realities in the various sub-regions of the Americas and the world. Combating illegal drug trafficking, corruption, transnational crime and HIV/AIDS, and promoting pre-emptive action to mitigate the impact of natural disasters featured among challenges he highlighted. He said that to truly fulfill its hemispheric role the OAS must firmly commit to helping states on critical development goals like maintaining democracy and good governance, upholding human rights, promoting social justice and equality, building sustainable economies, and reducing poverty—"in short, a program that recognizes the multi-dimensional nature of security and development." Ramdin also paid tribute to current Assistant Secretary General Luigi Einaudi, who was also the focus of a resolution the Assembly adopted in honor of his dedicated service to the hemisphere. Nicaragua’s Foreign Affairs Minister, Norman Caldera and El Salvador’s Ambassador to the OAS, Abigail Castro de Pérez, both hailed Ramdin’s elevation to the OAS’ second highest post. “CARICOM has won, the Americas has won, and we all are winners,” Caldera said. For her part, Ambassador Castro de Pérez underscored the opportunity now open for the OAS to move forward in helping to tackle the important challenges facing the hemisphere’s nations.